One sheet ORIGINAL MOVIE POSTER issued by the studio when the film was released and meant for theatrical display. This poster has been Linen Backed and is ready for framing. Very typical fold line touch up / restoration. We evaluate and grade our linen backed posters prior to linen backing / restoration. We do this because after a poster has been restored it can sometimes be very difficult to determine exactly what was done to it. Our restorers are world renowned and can make a poster look Near Mint and flawless even if it originally had several unsightly defects. This is NOT a reprint or reproduction poster! It is a REAL ORIGINAL MOVIE POSTER issued by the studio when the film was released and meant for theatrical display. Fold lines and other defects become less noticeable, sometimes even invisible. Linen backing can dramatically improve the overall appearance of a poster and it can substantially increase its value. It is the preferred archival method for conserving and/or restoring a poster. You may be willing to take the risk to save a few dollars, but we are not. We use super strong hi-quality packaging materials including thick cardboard, masonite, and costly pvc plastic tubes. Some of our posters are "between grades". For example, a C8-C9 poster will contain all the qualities/characteristics of a Near Mint C9 except for one or two very minor flaws that we believe prevent it from being a true C9. Sometimes it isn't possible to do this. Sometimes we can't roll a folded poster. Please note that if we hold your items for longer than 30 days they will NOT BE RETURNABLE. WE TAKE EXTRA SPECIAL CARE WHEN WE PACKAGE YOUR ITEMS. Folded posters are placed in a plastic bag or envelope and in between STRONG pieces of cardboard and taped together before being placed in the package. Rolled posters are put into a plastic sleeve and then placed in a HEAVY-DUTY TOUGH 3 or 4 diameter thick walled PVC tube. We roll the poster into a smaller diameter than the tube. This is VERY IMPORTANT because it gives the edges strength and helps to prevent them from getting wrinkled. We add soft cushioning material also very important! These combined charges can add up to 25% or more to your final cost. For other European countries the charges will differ. Please check with your postal system on their procedure for packages from overseas so you are not unpleasantly surprised. You must notify us before sending it back. This is extremely rare, but it does occasionally happen. We know how to create a listing that will provide you with the highest dollar possible. We can yield for you MUCH MORE than you would get if you auctioned them yourself up to TEN TIMES or more! Let us sell your posters for you! For more information about CineMasterpieces please see. We guarantee that all posters we sell are graded and described accurately. Unless otherwise specified in the description, ALL POSTERS ARE ORIGINAL MOVIE POSTERS original theatrical movie posters that were displayed or meant for display (unused) in theaters at the time the movies were released. We will put in writing that we guarantee it to be an Original Movie Poster. 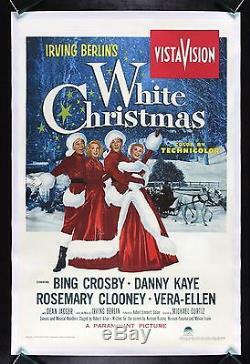 The item "WHITE CHRISTMAS CineMasterpieces ORIGINAL MOVIE POSTER LINEN HOLIDAYS 1954" is in sale since Sunday, July 10, 2016.